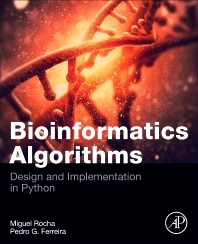 Bioinformatics Algorithms: Design and Implementation in Python provides a comprehensive book on many of the most important bioinformatics problems, putting forward the best algorithms and showing how to implement them. The book focuses on the use of the Python programming language and its algorithms, which is quickly becoming the most popular language in the bioinformatics field. Readers will find the tools they need to improve their knowledge and skills with regard to algorithm development and implementation, and will also uncover prototypes of bioinformatics applications that demonstrate the main principles underlying real world applications. Pedro G. Ferreira is an Assistant Researcher at Ipatimup/i3S (Portugal), where he has an FCT Investigator Starting grant. He develops research on computational biology in particular in the fields of cancer and population genomics. He has collaborated with several research groups and has been involved in different international consortia including ICGC-CLL, GEUVADIS or GTEx. He has intensive training in Bioinformatics and experience in genomics start-up environment where he has developed information systems for personal genomics data interpretation.